During their rookie mini-camp over the weekend the Chargers had several players on the field as non-contract tryout participants. Those are guys who were not drafted and went unsigned as rookie free agents. One of them showed the Bolts enough to earn a spot on the roster. Offensive guard Vi Teofilo was signed to a contract on Monday. The 6-foot-3, 315-pounder from Arizona State was a two-time honorable mention All-Pac-12 performer. 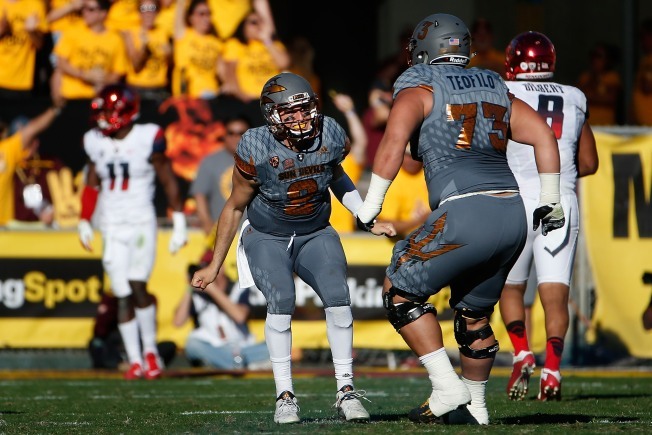 He started 40 straight games at right guard for the Sun Devils. Teofilo will wear number 64. With his addition the Chargers have signed eight new offensive linemen this off-season, as well as re-upping with tackles Joe Barksdale and Chris Hairston. The Bolts also changed offensive line coaches and offensive coordinators in an attempt to fix a line that contributed to one of the worst rushing attacks in the NFL. It would also be beneficial to keep quarterback Philip Rivers from being sacked another 40 times. San Diego also released guard Sebastian Johansson and injured linebacker Brock Hekking.